Should Comino visitor numbers be capped? As tourist pressures on Comino’s Blue Lagoon reach fever point this summer, environmental organisations believe a cap on the number of visitors may be needed to preserve the iconic bay. As many as 5,000 visitors land on Comino daily at the peak of the summer season, according to some estimates, many of them spending their whole time on the island at the Blue Lagoon. The situation has caused strife this summer due to deckchair hawkers breaching regulations and causing inconvenience to exploit the situation, but campaigners warn the effect on the sensitive natural environment could be even more serious. Maria Grazia Cassar, president of Din L-Art Ħelwa, which administers key heritage sites on Comino, said capping tourist visits was the best way forward. “The tourism industry should focus on quality, not quantity, as the carrying capacity of the site must be established and respected for the enjoyment of all,” she told The Sunday Times of Malta. Tourist caps are common at delicate sites overseas, with Iceland’s own Blue Lagoon and Italy’s picturesque region of Cinque Terre both having introduced similar measures recently. The approach is also considered in the Natura 2000 Management Plan for Comino. It calls for the implementation of a carrying capacity assessment for the Blue Lagoon, including seasonal variability in tourist numbers, landings of tourists by ferry, entrance fee options, zoning and patrolling. “Comino is a complex site and it has to be decided whether a carrying capacity should be established to cap the number of visitors,” the plan states, noting the large number of tourist visits is impacting the nature value of the bay. Martin Galea de Giovanni from Friends of the Earth Malta said Comino could only sustain a certain number of tourists without damaging the environment and the actual visitor experience. “Having said that there is no magic number as to how many visitors the island can sustain, and here is very little data on which to base such conclusions,” he told this newspaper. Mr Galea de Giovanni said that while a strict carrying capacity control should be considered one of a number of tools available to remedy the situation, it was more important to focus on holistic management and monitoring of the site. “Unfortunately the situation has only been deteriorating over the past summers, with authorities closing an eye to the blatant abuses that have now been taking place for the past decade, rather than providing NGOs with active support in order to protect the island and provide visitors with a pleasant experience,” he added, calling for long term plans to back up the enforcement blitz. However, there appear to be no immediate plans at government level to put these proposals into effect. 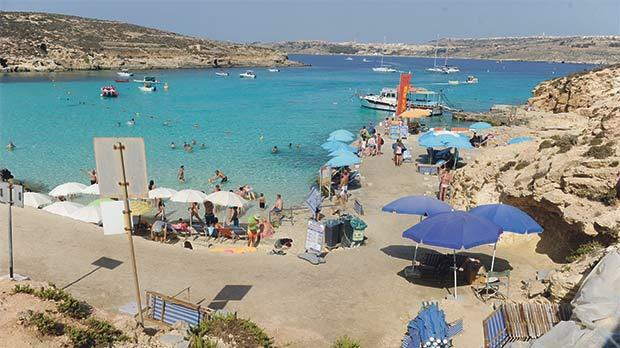 A tourism ministry spokeswoman said the authorities were continuously monitoring the situation on Comino and would continue with enforcement measures targeting beach hawkers.